The packed house at the Stephen Sondheim Theatre erupted into thunderous cheers and applause as King appeared Saturday night, sitting at a baby grand piano and singing "Beautiful," the final song. "It's kind of miraculous that this show has lasted for five years because not many do. And it's a testament to, I think, people say the music ... but the book is so good and the direction and the lighting and the sets. It's really a well-put-together production," King said in an interview with the Associated Press after the show. 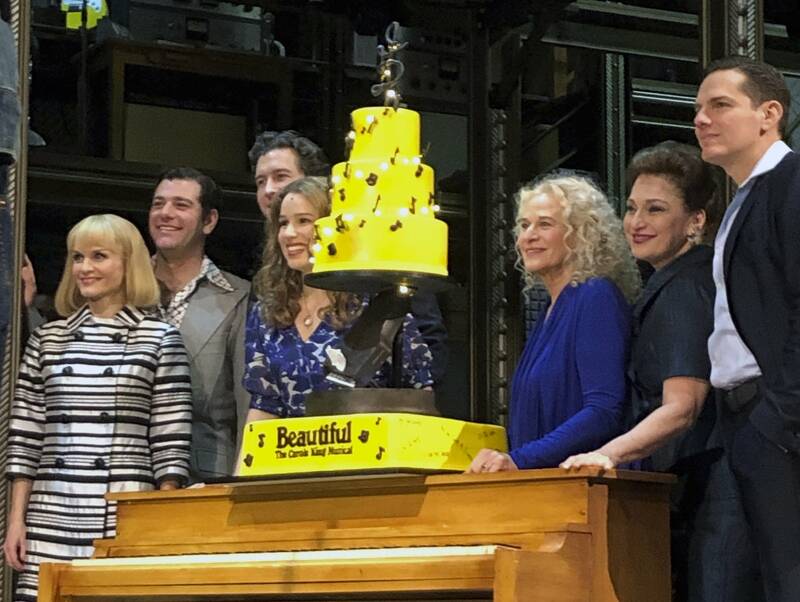 "Beautiful" is based on King's life from when she was a teenage songwriter in New York, to her time as wife, mother and author of scores of recognizable songs. The show features a collection of famous pop music, written by King and her ex-husband Gerry Goffin, as well as Barry Mann and Cynthia Weil, including the classics "You've Got a Friend," "One Fine Day," "Up on the Roof," "You've Lost That Lovin' Feeling" and "Natural Woman."